Lay the bacon out on a baking tray in 2 rows of 3, overlapping each slice to make 2 rectangles. Halve the avocado, remove the pip and carefully peel each half. halves so that they sit without wobbling. Place each in the middle of a rectangle of bacon. Crack an egg into the pip-whole of each. 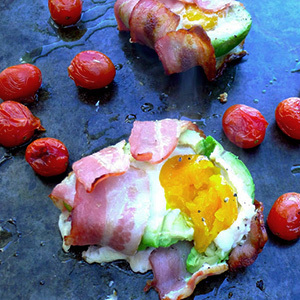 Wrap the avocado halves in the overhanging bacon. Scatter cherry tomatoes into the tray, drizzle over a little olive oil and bake in the oven for 25 minutes.